Our in-house caterer Café Connect has expanded its catering offer in response to customer feedback. New Breakfast Buffet and Afternoon Tea menus have extended the range of catering packages available from Café Connect, after the team took on board feedback from visitors attending conferences, meetings and events at the Acklam Green and Resource centres. The Breakfast Buffet includes a selection of freshly baked croissants and pastries or hearty bacon or sausage rolls along with fresh fruit and yoghurt. Priced at £3.90 per person, the menu also includes plenty of tea, coffee and orange juice. Meanwhile, the indulgent Afternoon Tea menu represents fantastic value at £4.50 per delegate and £6 for café customers. It includes a selection of finger sandwiches, savoury and fruit scones served with preserve and whipped cream, a selection of homemade cakes or tray bakes and a choice of tea, coffee or herbal tea. Café Connect has also extended its hot and cold buffet packages to suit customers’ needs. The menu now includes three hot buffet options including lasagne, chicken curry and chilli as well as a deluxe hot and cold buffet including sugar baked home roast sliced ham with a selection of salads and quiche. Vegetarian options are also available. 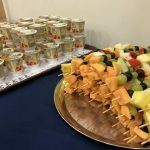 The catering packages include additional healthy items to reflect the organisation’s commitment to the North East Better Health at Work programme, for which it has just received the Bronze Award. Donna Smith, facilities manager, said: “We take the views of our clients very seriously and always look for ways to adapt our offer to best meet their needs.